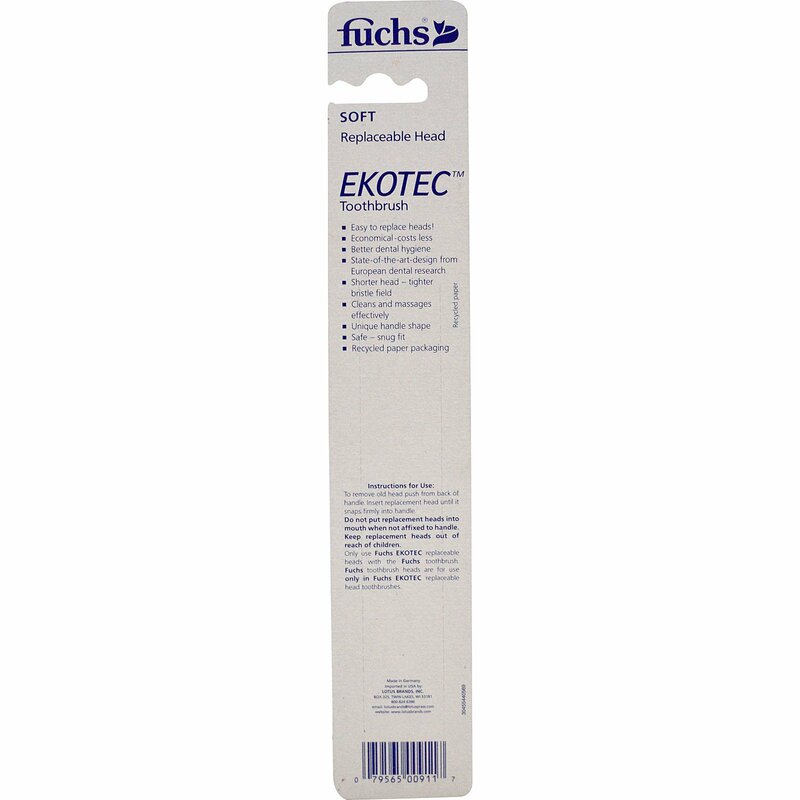 Another example of Fuchs commitment to world leadership in dental technology is the patented EkoTec Replaceable Head Toothbrush System. This product represents the ultimate merger of superior dental care with environmental awareness. The EkoTec's bristle field is compact, in keeping with the latest trends and advances in European dentistry, to ensure easy access to all areas of the mouth. First, it saves you money. When the head wears out, you pay only for the replacement heads, rather than for a whole new toothbrush. Second, it's good for the planet. By cutting down on the number of handles repeatedly thrown away, you can help alleviate problems of landfill overflow and waste disposal in your local environment. All EkoTec toothbrushes come with three replacement heads; when these have worn out, you may continue to purchase convenient EkoTec Replacement Head Packs until it is finally time for a new handle. Third, EkoTec is hygienic. Any toothbrush will become less effective over time, due to deterioration of bristles and the buildup of bacteria. Dentists tell you to change toothbrushes every 4-6 weeks. It is particularly important to replace a germ-filled toothbrush after a bout with the cold or flu; this helps avoid reinfection during your recovery. However, few people actually keep to this schedule. We forget to get new toothbrushes or fail to keep a reserve supply on hand. With EkoTec, however, replacing a toothbrush is easy: you just pop out the old head, pop in the new one, and brush! You get three heads with your first purchase and four heads with each replacement pack, so you should always have some on hand. Better replacement habits mean better care of your teeth and gums. By using EkoTec, you can always achieve optimum care levels for your teeth and gums by disposing worn-out toothbrushes before they harm your dental health. To remove old head push from back of handle. Insert replacement head until it snaps firmly into handle. 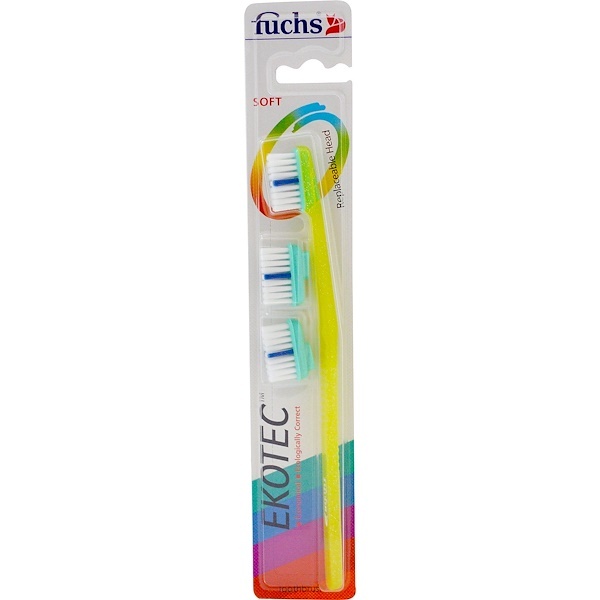 Only use Fuchs EkoTec replaceable heads with the Fuchs toothbrush. Fuchs toothbrush heads are for use only in Fuchs EkoTec replaceable head toothbrushes. Do not put replacement heads into mouth when not affixed to handle. Keep replacement heads out of reach of children.